This wasn’t one of those bad, game-killing decisions that requires hindsight to identify as a mistake. It’s no less baffling the morning after as it was the moment Eli Manning floated the ball out of the end zone to stop the clock and gave the Cowboys a full minute-and-a-half to complete their comeback. If there’s any credit you can give Tom Coughlin and Eli Manning, it’s for recognizing and admitting just how badly they fucked up. “One-hundred percent on me right there,” Manning volunteered. Gentlemen! There’s plenty of blame to go around. The Giants had no business winning this game from the beginning, but a series of timely takeaways put them up 10 points with under eight minutes left, seemingly in control for an upset win in Dallas. 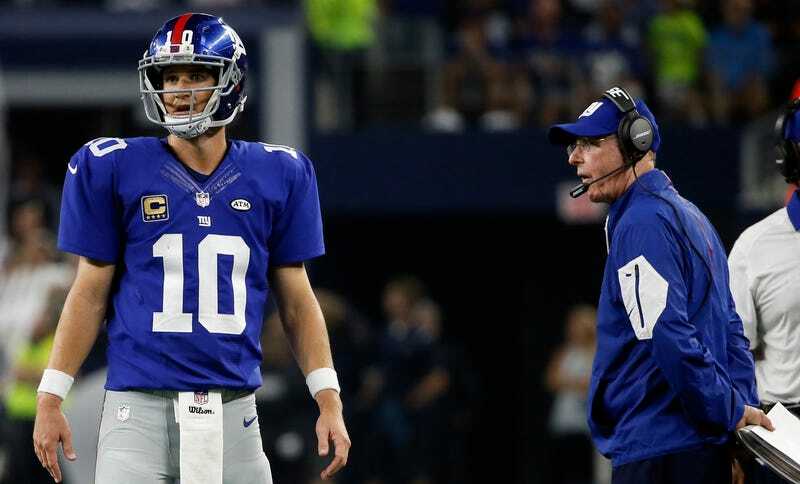 That’s about when the offense forgot all clock-management procedures and the defense, which had harassed the Cowboys into three increasingly crucial turnovers, started sitting back and letting Tony Romo go through them “like a hot knife through butter,” as Coughlin put it. A three-minute touchdown drive made it a three-point game, and the Giants offense took over with just over five minutes left. Usually with that little time left, a few first downs should seal it. Instead the Giants offense managed to have its most efficient drive of the game, running 13 plays and marching 79 yards and stubbornly refusing to do it slow enough to deny the Cowboys the chance to answer. Dallas caught a break on the first play after the two-minute warning, when the Giants gained a first down to the Cowboys’ four. Dallas had jumped offsides, and the penalty was declined, but per NFL rules the clock stopped anyway. That spared the Cowboys from having to burn a timeout, and they used their remaining two to halt the clock after two Giants runs up the middle. On third and goal from the one, with 1:43 remaining, the Giants called a pass. The play-calling was Ben McAdoo’s here, but there was plenty of time for everyone to be on the same page. Eli Manning took the snap, rolled to his right, saw no one open, and threw the ball out the back of the end zone. That stopped the clock—40 crucial seconds handed to the Cowboys. They would score the winning TD with seven seconds left. Coughlin said his mistake was not calling a run. I’m not so sure the play was inherently wrong. Everyone was expecting a run, the safest and most logical call. If a receiver breaks free and Manning finds him for a low-risk toss, the game is over. (“That’s a good call,” Tony Romo said. “It really is...there’s a high percentage that we’re going to think they’re going to run the football there. )” Of course, worst-case scenario, a run gets stuffed and the clock ticks down to a minute remaining. That would have been infinitely preferable to what happened. When Manning saw no one open, he should have gone down. Slid, taken a knee, taken a sack, whatever—anything but stopping the clock on an incomplete pass. Manning’s a veteran; when the play-call came in, he had to realize that keeping the clock going was secondary only to scoring a touchdown. He had to be aware what he’d need to do. Coughlin had to make sure he was aware. With the two handoffs on the two previous plays, there was plenty of time for the Giants to be on the same page. They blew it—there’s nothing else to be said. There is more second-guessing to be done, if you want it. The Giants could have run another play on fourth down. If they scored, it would have been over. If they didn’t, the Cowboys would have gotten the ball on their own one, and run their final drive differently, knowing they could play for a field goal and overtime. New York’s decision to kick a FG was frustratingly risk-averse, but at least it was understandable. The decisions made on the previous play were inexplicable and inexcusable. It’s the most painful sort of loss for fans watching at home and yelling at their TVs, because, for once, those fans could have done better.